Thank you to everyone who participated in our giveaway! Two winners have been randomly selected and notified via email. Cheers! 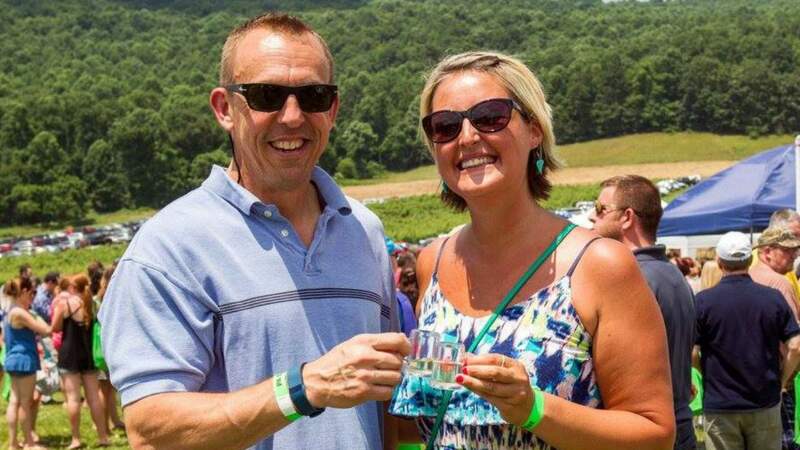 Still didn’t get your tickets to this month’s PA Cider Fest, the summer’s premier cider tasting event? Don’t worry—we’re giving two lucky individuals a pair of tickets for the June 24 cider celebration. Which cidermaker are you most excited to see at this year’s event? Two lucky winners will be randomly selected on June 9; each will win a pair of tickets to PA Cider Fest. Good luck! I’ve never had any being from NY. I’d like to try them all. I am so excited to see Civil War Cider at PA Cider Fest this year! Hauser’s Estate Winery. Jack’s Hard Cider. Jack’s Hard Cider of course!! Bad apple ciderwerks!! I’m excited to wear my tank top this summer! Jack’s Hard Cider and Good Intent Cider! Loved that breakfast cider small batch from Jack’s last year! Every single one of them! Never had PA cider ? Making te drive from Baltimore!! Looking forward to Fastball!! Jack’s hard cider. Hauser winery. I am totally looking forward to seeing wyndridge at the cider fest. An awesome cider!!!! Hauser’s Estate Winery. Jack’s Hard Cider. Love it! Wyndridge farm and jacks for sure. I’ve only ever had Wyndridge from that list, so I’m looking forward to trying the rest! I’ve only had Wyndridge from that list so I’m looking forward to trying the rest! Excited to see our friends at Dressler Estate! Big Hill and Ploughman! Both are pretty close to where I live. Bad Apple Ciderwerks because I can’t get their cider any other way. I’d love to taste the others, I may find several new favs! Big Hill! And seeing my husband get to enjoy gluten free alcohol ?? I’m most interested in Arsenal and Moon Dancer’s ciders, but would certainly love to try them all! I’m used to dry & acidic Virginia ciders so I would love to see how PA ciders differ! The entire event sounds amazing! Especially for us gluten free folks. Love Wyndridge and Good Intent; anxious to try the rest. Stone and key. Excited to see if they have anything new! Moon Dancer Cider House solely because I like the name haha. I’m sure they’re all fantastic though. I love hard ciders! Looking forward to going to the Cider Fest! All of them will be! Our first time attending as this is what I asked for as my birthday present. Cider fest & an overnight at a B&B! Pick me please. All of them since I loved a lot last year but I really like Big Hill Ciderworks! It would be my first time trying any ciders from PA, so I would look forward to trying all of them. Bad Apple Ciderwerks! Can’t wait! Wyndridge Farm, They’re my favorite! Lancaster County Cider! But really, I’m excited to try them all ? Since this will be my 1st Cider Fest, I am unsure whom I look forward to seeing there, I need to try them all to make my decision. I’m most excited to experience Jack’s Hard Cider! I’ve heard many good things about them. I am excited about all of them but Lancaster County Cider the most!!! Arsenal cider house! Tried them once in Pittsburg and have been wanting it again ever since! Big hill is my favorite so far but excited to try the rest too. I’m excited to try Civil War Ciders? I love ciders but am not familiar with what’s available locally- I would sincerely love to try them all. Are there any from Chester County entered? Thanks for offering some free tickets. See my above comments. I’m keeping my fingers crossed. Thanks. Can’t wait to try Ploughman’s! I’m really looking forward to meeting Joe Getz of Kurat Cider. Coming all the way from Cincinnati! The all sound good, but I am most excited to try Big Hill Ciderworks.